If you are looking for information on the QuickSELLit franchise business opportunity, Quick SELLit franchises or Quick SELL it franchising, then you have come to the right place. The eBay Drop Store business is one of the best, low cost, business opportunities of the year according Franchise Entrepreneur Magazine. The TOTAL investment to open a QuickSELLit store is $49,000. This includes everything from your first month's rent, security deposits, licenses, trailer, exterior and interior signs, remodeling, all fixtures and equipment, store setup, training, extensive grand opening advertising and more. The TOTAL investment to open a QuickSELLit store is $49,000 and that means COMPLETE. If you are measuring QuickSELLit against any other franchise in American be sure the investment cost is COMPLETE. QuickSELLit stores are generally 1,200-1,500 square feet located in shopping centers convenient to the community. 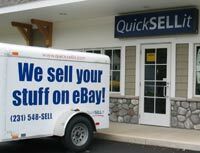 Other eBay Drop store franchises insist their store open in high cost shopping centers that can cost you upwards of $3,000 a month or more. Not QuickSELLit. Being in such centers increase fixed overhead of your store by more than 300% based on current QuickSELLit rentals ($1,200-$1,800). QuickSELLit will help you identify such locations and negotiate a lease that will maximize your income. It doesn't matter if you have no business or computer experience. QuickSELLit is ideally suited for you. QuickSELLit's experienced staff diligently trains you to become the best in the business. During your one week training and store set-up you will learn every phase of the business under actual in-store operating conditions. You will train in our corporate store as well as actual franchised locations. When you graduate you'll be confident in operating your own QuickSELLit and you'll be prepared to build your business. Opening your QuickSELLit store is fast, easy, and fun using our "Quick-Store" setup system. After graduation, and after the store is remodeled, an arrival date is scheduled for QuickSELLit staff to arrive at your store for setup. Not a third party. And, among all of the dozen or so national franchises QuickSELLit gives you the best opportunity to maximize your investment. Why?